Northern Fur Seals. Photos courtesy of Stephen Insley, University of Victoria. Northern Fur Seals are found in the North Pacific. Their primary rookeries are in the Bering Sea, with small numbers also breeding on San Miguel Island off southern California. Males leave the rookeries to feed near the Aleutian Islands in the Gulf of Alaska, whereas females and juveniles migrate as far south as southern California. They spend 6-8 months feeding at sea on a wide variety of fishes and cephalopods. 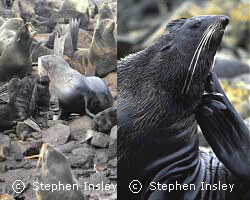 Northern fur seals are part of the family Otariidae, called the eared seals. They have a visible ear flap and are able to slightly “walk” on land using their hind flippers. Males of this species are significantly larger than females and weigh 200-275 kg (450-600 lb). The females only weigh 40-50 kg (90-110 lb). To keep warm in their cold water habitat, they have a dense fur cover with almost 350,000 hairs per square inch.In order to procure a mate and defend its territory, the male fur seal often emits a low, growling noise while out of the water, which can be heard for some distances. In addition, they produce underwater vocalizations including clicks and bleating sounds. Studies of in-air vocalizations between mother-pup pairs found that northern fur seals are able to recognize each other’s vocalizations within a breeding season (after 3-4 weeks), between breeding seasons (after 1 year), and between several seasons (after 4 years). This is the longest example of individual recognition by any species in the wild.